What can you, the employer, do today to help your employees eat healthier? How can my organization help promote long term healthy lifestyles of employees? There is great value in having a structured corporate wellness program to help improve the health of your employees. A program that also incorporates wellness coaching will provide additional support for your employees. 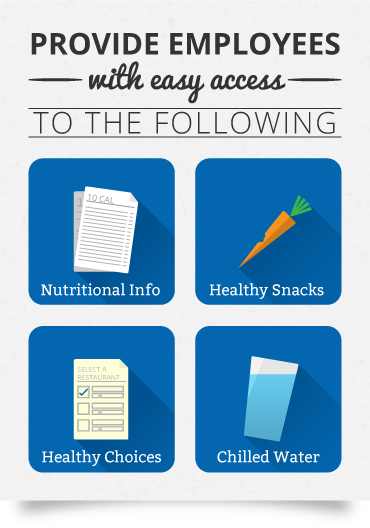 Provide healthy food options in the cafeteria, the vending machines or at workplace functions. This will give employees the option to make better choices. Offer coverage for meetings with a Registered Dietitian or a Nutritionist to help ensure that your employees are following credible and healthy nutritional plans. Provide opportunities for Lunch and Learns about healthy eating and provide informational handouts regularly. Ensure your employees are aware of any nutrition resources already provided by your organization, such as an Employee Assistance Program (EAP) or corporate wellness program. Partnering with the right wellness platform, such as Well Nation®, can help positively impact your organization’s overall health by providing the tools and resources needed to become healthy and save in healthcare costs. With convenient targeted nutrition wellness coaching, individual and corporate healthy lifestyle challenges, and a healthy habits tracking and reward system, Well Nation® offers a suite of comprehensive and easy-to-use resources to improve eating habits and promote overall healthier lifestyles. To learn more about Well Nation® contact us.